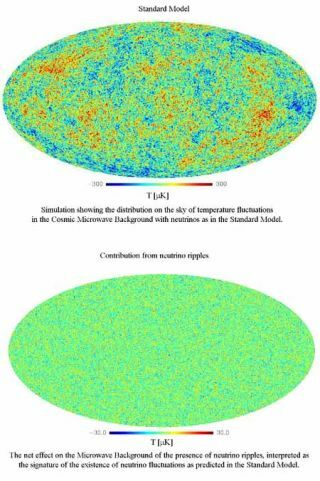 A simulated map of the hot and cold spots in the cosmic microwave background. The top image assumes the standard cosmological model. The bottom image shows the contribution from neutrino ripples to the above fluctuations. Neutrinos are tiny particles that can plow through the center of the Earth without even a hint of a whisper. Every second, billions of them rain down--and up--from outer space. Some of these cosmic ghosts were witnesses to the first seconds of the universe. Now, for the first time, density fluctuations have been observed in these oldest of neutrinos. "We know there is an ocean of neutrinos out there, but what we have shown is that there are ripples on it," Roberto Trotta of the University of Oxford told SPACE.com in a telephone interview. The detection provides additional confirmation of the standard cosmological picture, as well as the fundamental theory of particle physics. Neutrinos are subatomic particles with no electric charge and very little mass. They are extremely hard to study because they have a very low probability of interacting with the rest of the world. According to the standard theory, neutrinos arose in large numbers out of the fires of the Big Bang. These so-called "background" neutrinos still exist: with 2,500 of them inhabiting every cubic inch of the universe. Trotta and Alessandro Melchiorri of La Sapienza University in Rome have found evidence in the universe's distant past for wrinkles in this neutrino background. "It has been one of the holy grails of cosmology to find the neutrinos that were made in the Big Bang," said Scott Dodelson from Theoretical Astrophysics Group at Fermilab. "This is another piece of indirect evidence." Besides supporting the Big Bang theory, the ripples also provide a unique test of neutrino physics. To detect individual neutrinos, scientists use huge detectors--sometimes made of water or ice. Billions and billions of neutrinos pass through these particle traps unfazed, but every so often one of the elusive quarry gets snagged. However, these detected neutrinos--coming from the Sun, or from cosmic rays, or occasionally from distant explosions--have millions of times more energy than the background neutrinos. Having lost much of their energy as the universe expanded and cooled, the background neutrinos are impossible to see in any current--or even proposed--detector, so Trotta and Melchiorri looked at the effect that neutrinos would have on another relic from the early universe--the cosmic microwave background. The cosmic microwave background (CMB) is a snapshot of the universe as it looked 380,000 years after the Big Bang. Back then it was a fairly boring place, with no galaxies or stars--just minor fluctuations (one part in 100,000) in the density of matter. This clumpiness left its imprint in temperature variations in the CMB. Light emitted from a dense clump would appear--after traveling billions of light years to reach us--as a hot spot in the microwave sky. Astronomers made a detailed map of these CMB spots with the Wilkinson Microwave Anisotropy Probe (WMAP) in 2003. Although the matter clumps were small in the beginning, gravity has congealed them over time to form galaxy clusters, planets, and everything in between. Neutrinos are a relatively small player in this part of the story because they rarely interact with the structure-forming material. But collectively, the gravitational pull of the ripples can influence the clumps. "Neutrinos can't talk to the matter and photons directly, but they can affect the CMB through their gravity," Dodelson said. Trotta and Melchiorri showed that there is evidence for neutrino ripples in the WMAP data. Basically, the neutrino density tends toward being smooth, so fluctuations do not to last very long. As "neutrino wrinkles are ironed out," said Trotta, they drag on the matter--effectively reducing the number of small-sized clumps. The ripple detection conflicts with theories that predict certain neutrino interactions, which are not part of the standard model of particle physics. These now-disfavored theories would have expected a smoother neutrino density due to these extra interactions. Remarkably, the ripples--which at the time of the CMB were around 100,000 light years wide--tell us something about the physics at scales smaller than the atom. "We are using the whole universe as a particle physics experiment," Trotta said. Measuring neutrino ripples is currently the best way to probe this area of neutrino physics. The research will be published in the journal Physical Review Letters.